Eric Kuiper, Chief Creative Officer at Studio C, curates the annual ArtPrize On Screen film festival lineup. ArtPrize: When did Indie films first pique your interest? Eric Kuiper: When I was in college, movies like Donnie Darko, American Beauty and Magnolia really started to expand my understanding of what film was all about. In 2005 I made my first trip out to Park City, UT for Sundance Film Festival and that really changed things for me. I was hooked on the experience of watching films coming from independent and increasingly diverse voices. 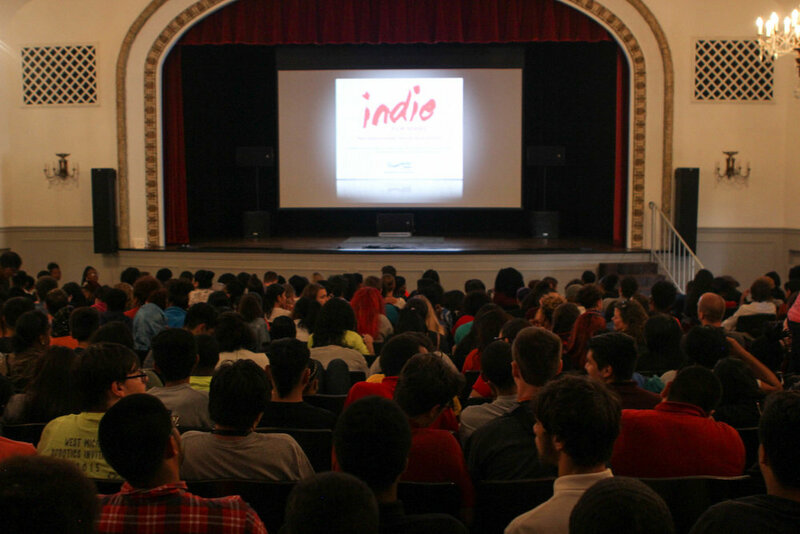 What makes you so passionate about exposing Indie films to the Grand Rapids arts scene? Story is the way we makes sense of the world around us. While movies are a great way to be entertained or just escape our daily routines, they are so much more than that. I love it when a film disrupts me. Great films, and indie films are often the best example of this, give us insight into the lives of others. The camera can bring us into cultures, places and experiences that we’d otherwise never get to experience. And while this often shows us the uniqueness of other people’s lives, we inevitably experience the commonality of our humanity as well. The more this happens to us, the greater our empathy for ourselves and others—and that’s something worth building in our world right now. How do you go about selecting which films will be ideal candidates for ArtPrize On Screen? There are a handful of things I’m looking at each year. First, it needs to be a well made film. That can take on a lot of different looks, but it’s important to me that the film tells a story well visually and otherwise. Secondly, I love bringing films into ArtPrize that feel like they’ll interact conversationally with each other and the other art I’ve come to expect at ArtPrize. So I’m looking for films that have something to say about the current cultural moment we’re living in. This year Bisbee ’17 and A Long Time Coming: A Baseball Story are good examples of that. Thirdly, because this is ArtPrize, I’m on always on the lookout for films that in some way interact with the art world or artists in some interesting way. This year White Rabbit, Kusama: Infinity, and Love, Gilda are all films that center on artists in really different and interesting ways. And then finally, any time a local filmmaker like Joel Potrykus has a new film, this seems like a really great way to get their work in the mix of ArtPrize as well. What are some of your favorite films from ArtPrize On Screen? I’ve really loved all the films that have played in the program. In 2017 we focused entirely on documentary films, which for some may have been unexpected. We often think of documentary films as a form of journalism—which they are. But doc films are much broader and more interesting than that. Some of the most innovate things happening in film right now are happening in the documentary space. These filmmakers are real artists in their own right. What film(s) are you excited about this year? In your opinion, what unique value(s) does film add to the ArtPrize portfolio? The form of a feature film pushes back on the way we consume art during ArtPrize. If you want to interact with a film, it takes time. It unfolds overtime—which is actually true of many other art forms that are specifically time-based, like a movie is. You can’t really take in a great painting or sculpture in 30 seconds either. So having some elements of ArtPrize that challenge the quick, mass consumption pattern of taking in the art is a good thing, in my opinion. The other piece that feels important to me is the recognition of filmmakers as contemporary artists with unique voices and points of view, in the same manner as other mediums that show up at the festival. Can you talk about your background in film and how you’ve progressed into your involvements with it today? I took film classes all the way through school. I’ve always been more focused on film viewing than production. I love the experience of a movie—the way a story works on people and how effective of a shared experience it can be for groups of people. I went to grad school to study theology and decided to focus on theology and popular culture, in particular, film. That’s what brought me to Sundance the first time. After that, I started heading to film festivals like Toronto International Film Festival, SXSW and Sundance every year and bringing people along with me. I also started a film series that played at Wealthy Theatre for a few years. I wanted to create a inroad for others into the world of film that was deeply experiential. Through the trips to Sundance JD Loeks and I got reacquainted and that’s untimely what lead to my joining the team at Studio C and programming films for Celebration! Cinema as part of my work.